Today the Holy Church celebrates the life of St. Ubadlus, Bishop of Gubio and Confessor. 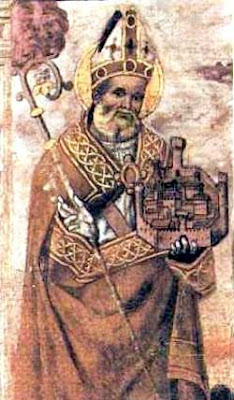 Born to noble parents, St. Ubaldus lived a pious childhood. After his father died while Ubadlus was still quite young, the boy became a canon regular for the local Cathedral. After being consecrated Bishop of Gubio by Pope Honorius II, he returned to his people and became a perfect pattern of all Christian virtues and a powerful protector in all their spiritual and temporal needs. It is said that St. Ubaldus helped prevent Frederick Barbarossa from sacking Gubio when the bishop went out on the road to plead with Frederick. He died of natural causes after a long and painful two year illness in 1160. At the solicitation of Bishop Bentivoglio, Pope Celestine III canonized him in 1192. His power, as we read in the Office for his feast, is chiefly manifested over the evil spirits, and the faithful are instructed to have recourse to him "contra omnes diabolicas nequitias". Help us, O Lord, and stretch out Your right hand in compassion to save us from the wickedness of the devil, through the intercession of Your blessed confessor bishop Ubaldus. Through Our Lord . .